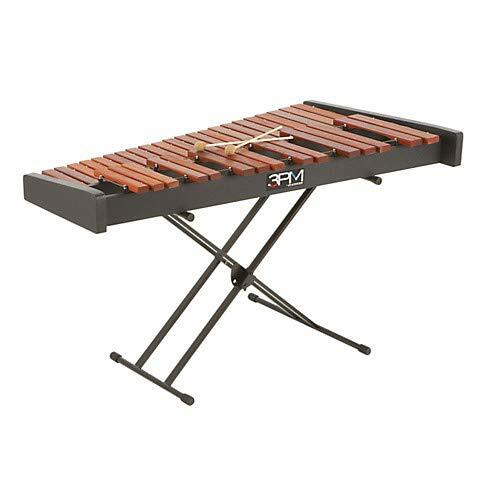 The Musser M3PM 3 Octave Practice Marimba features a full 4 graduations of bars of Padauk wood for real playing experience. The instrument ships with bars already attached and assembled, and comes with an x-stand, cover and mallets all in one box and ready for immediate set up and playing. Resonators have not been added to this practice set for both volume and cost considerations. The frame of this instrument has been built so that the M3PM can stand on its side and be kept out of the way against a wall to save space. Also the instrument can be slid under a bed for space savings. ‘Reversed Post’ technology is employed on the bumpers so that the bars will not fall off when tipped on side.